Drastically cut down on carbs: I do a flexible version of “slow carb” diet. Pretty easy to achieve: no rice or bread on weekdays. Replaced grains with lentils and quinoa. Very little dairy. Moderate rice, bread, desserts and other forbidden stuff on one or two days of the weekend. Also force myself to walk or bike as much as possible for chores and such. Teetering on 23 BMI. One just walks away from the US or local Westernized lifestyle. When I did the second return to Sri Lanka in 2010 (I am not a Dual Citizen, just a Sri Lankan). Was diagnosed with 500 (mg something or the other, there is a Australian measure). Forget about the measures. If I walked in the garden/property my feet would get infected. At that time could afford hired help (savings from the US ). Now, I dont have hired help. I do most work by myself. I work in the rain, mud etc. No real choices in food and liquor. To me its all about hard work in the fields, bare bodied (unhappily one becomes none Aryan (ha ha)). I have a BMI of 27. I do not do a lot of dieting. I walk for about 1 hour a day – not an intense one though. I am nearing 60. No diabetic or any other major health issues. I am a bit broad in built, so BMI does not worry me much, though a small paunch that shows up when I put on a tight T-shirt worries me aesthetically. I once checked some other body fat measure and it came out OK, i.e. within healthy limits, maybe because I am built on a stouter scale. 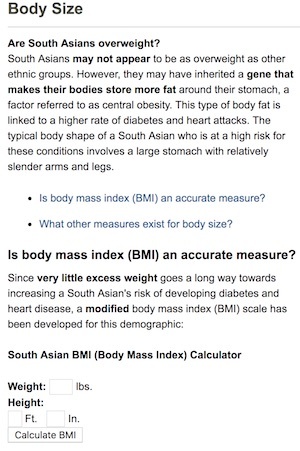 I would’ve thought that Body Fat Percentage together with BMI would be a better indicator. There are even devices to measure BFP but those don’t seem popular – perhaps because the cheap ones aren’t accurate and the accurate ones aren’t cheap? I am also tempted to conjecture that BFP among south asians is likely to be caste dependent. yeah. the accuracy is the main thing. that being said, i think they might be somewhat precise (i have a few). Interesting, is this heritable or not in your opinion? One can observe the difference of course between a completely ripped fisherman and an office worker, but is there more to it? The excerpt from pamf.org with which Razib started this post says “However, they may have inherited a gene that…”. That said, I was stating it as a conjecture, and not an opinion; perhaps it can be easily proved or disproved by someone who knows the relevant genes well, whether they come from AASI or Steppe or near eastern farmer. Both. Table sugar is largely out the window. If you like meat, indulge. Strength training, be it heavy barbell compound movements or just body weight, either work. I worked for some years in software development in the Midwest. 80% Indian. We would pick the best kids from our Pune office, fly them to the US and give them green cards. They’d arrive skinny, noisy, in shorts and sandals, but in months they had mellowed down, dressed up, and spreaded out quite a bit… The US is bad for waistlines, but it seems specially deadly for south Asian ones. My weight loss (at 43, 88 to 80 kg, BMI 26 to 23) came by running, removing sugar almost completely, and avoiding unnecessary carbohydrates such as toast for breakfast every day, and go for salad and veggies when available. With two small kids, I cannot stop pasta, but I reduce the dose.